Bearing drive shaft in the gearbox, suitable for Citroen 2CV. 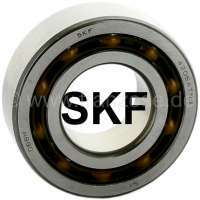 Manufacturer SKF. The bearing does not have a groove. Measurement: 52 x 25 x 16. Shaft seal drive shaft at the gearbox. 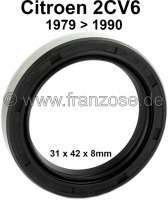 Suitable for Citroen 2CV starting from year of construction 1979. Measurement: 31 x 42 x 8mm. Made in Germany.